It all started with uber delicious Mysore Bonda, then we moved on to making Vegetarian Rogan Josh and last month we all munched on some crunchy Cornmeal-Orange Cookies.Yes, it is time for some free-spirit-blogging again. For the month of August, I chose the theme as - "Favourite Main Course Dish which we had in any Restaurant". We all have our favorites, don't we. those bajjias from your favorite stall which you crave in the middle of the night, the yummy dessert dish which you had in a restaurant during one of your travels that always stays with you and the taste still lingers in your mouth. I wanted my FSB pals to re-create the magic in their own kitchens. I have my absolute favorites too. Bagels and Cream Cheese for instance. Are you one of them who associate food memories with some distinct places? I do that all the time. I had some of the best bagels in NYC and then in Washington DC. I ate them every single day, for breakfast. Whenever I think of Bagels, they remind me of the wonderful times I had and the fun people I met in these two cities. Then, I moved to California. That is when I fell in love with Mexican cuisine. It all started with Chipotle, then I moved on to visiting local, nameless restaurants in Mountain View which served hands down some of the best quesadillas, salsas and chile rellenos I ever had. I would always go for a full mexican platter complete with - fresh guacamole, sour cream, rice and beans. For me, Chile Relleno reminds me of Mountain View, California. 2. In a small bowl, combine maida, milk, egg, baking powder, baking soda, salt and a tsp of oil. 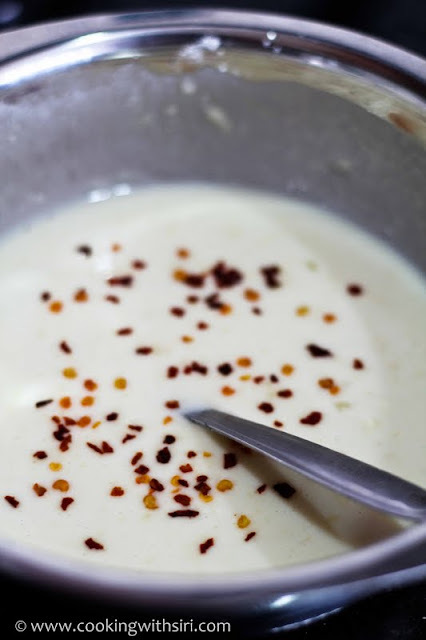 Spinkle some red pepper flakes over the batter and whisk well. 3. Stuff each of the peppers with the cheese. 4. Heat enough oil in a wide pan. 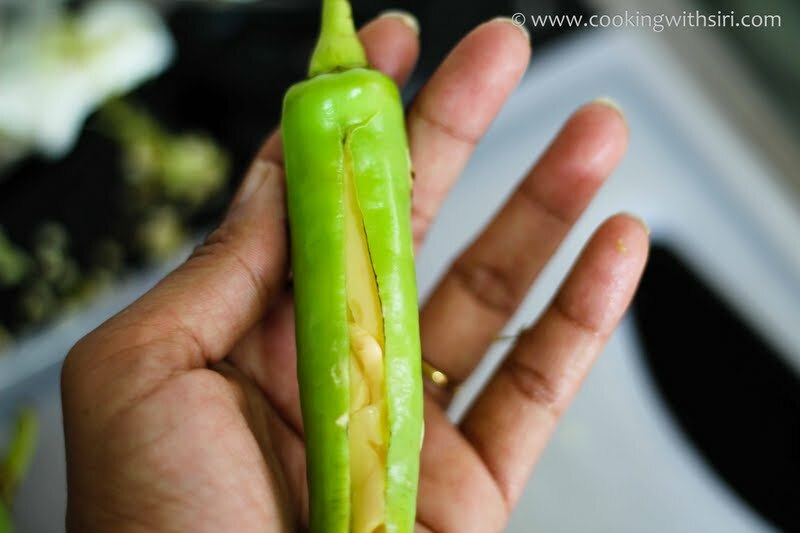 Roll each pepper into the batter, carefully dip and fry in oil until light golden brown. Using a slotted spoon, remove them onto paper towels to drain excess oil. 1. Blanch tomatoes for few minutes in hot water. 2. Heat olive oil in a pan and saute onions & garlic until translucent. 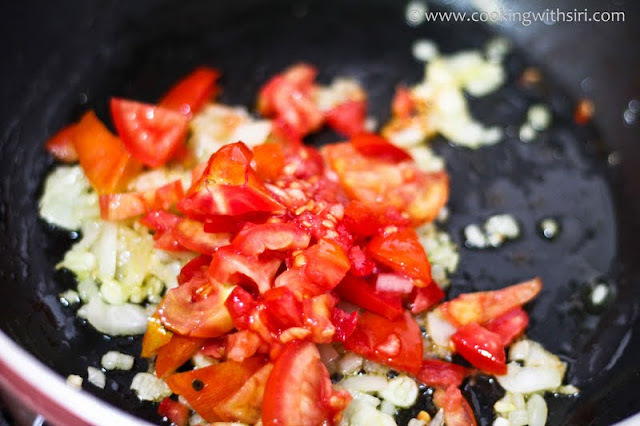 Mix in sliced, blanced tomatoes and cook until mushy. Add tomato puree with salt & pepper. 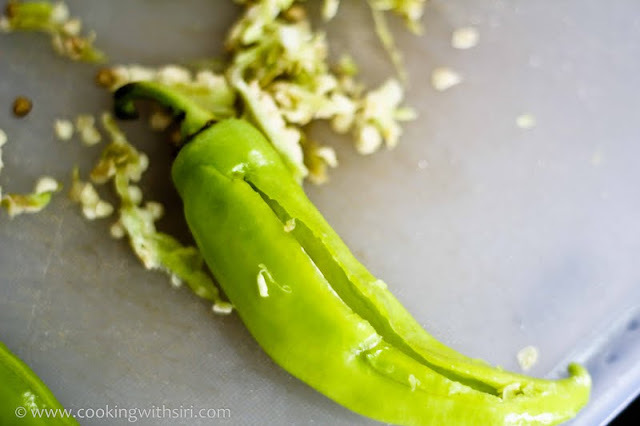 Add about 1 cup of water to bring it to a thick saucy consistency. Cover and cook for few minutes. 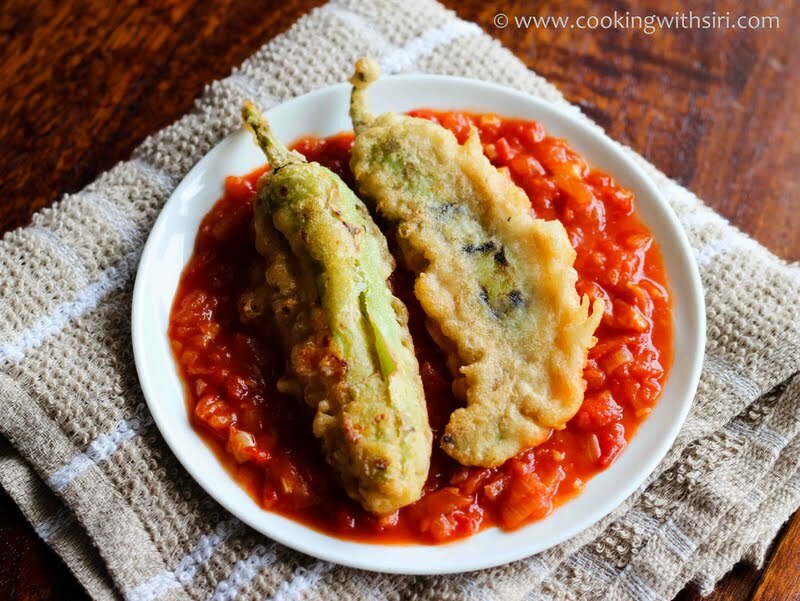 Spoon some tomato sauce on a plate and place chile rellenos on top. Serve with cilantro-lime rice, beans and guacamole on the side to make it a complete mexican platter. Looks so delicious. I cannot help but bookmark this one. That one seems super yumm! 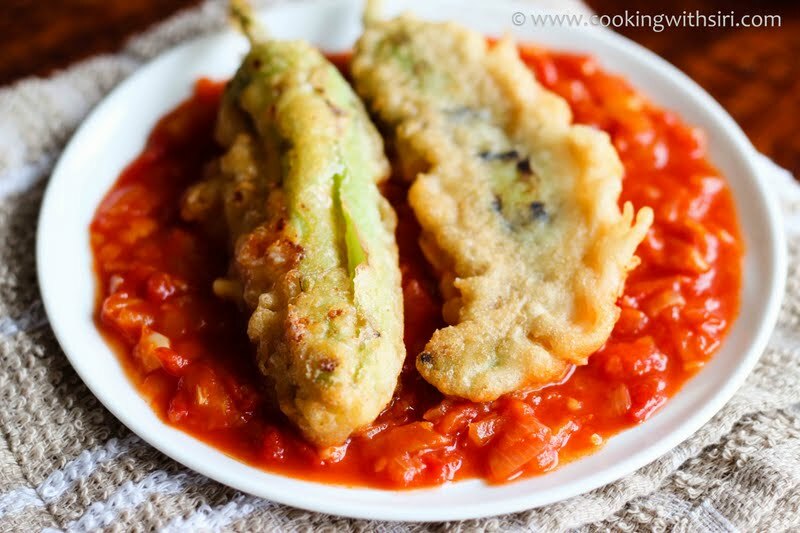 I am wondering if the stuffing inside and the coating make the peppers less hot and easily go for more servings. Love these with the sauce. I cannot believe I've never eaten this at any Mexican restaurant. How did I miss it? Well, now that I know to make it, thanks to you, I'm going shopping for the ingredients! This is one of my all time favorite MX dishes. This looks terrific! I order chile rellenos when I go any Mexican place. They are my fav too :) Thanks for the recipe. Yeah California is known for authentic Mexican cuisine. Lovely looking dish!!! What an eye-catching gravy ! !really tempting me to try this..